You are here: Home / Blog / Liquid Handling Solutions / What is the Most Ergonomic Electronic Pipette? What is the Most Ergonomic Electronic Pipette? Two of the pipettes that claim to be the most ergonomic electronic pipette in the liquid handling market are the Sartorius Biohit Picus and Rainin E4 XLS. Why? Biohit is the creator of the electronic pipette and Rainin is the innovator of LiteTouch™ technology. Both of these manufacturers present electronic pipettes that they claim to be “ergonomic.” According to a study in Applied Ergonomics, led by G. David and P. Buckle, lab technicians who utilized manual pipettes more than 220 hours per year had more hand complaints compared to those who pipetted less. In order to alleviate hand injuries among lab technicians who are pipetting long hours on day-to-day basis – electronic pipette is the revolutionary and ergonomic solution that needs to be considered. 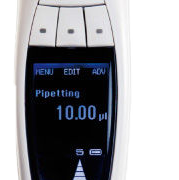 An electronic pipette is ideal for a lab technician that is working in a lab focused on completing a large quantity of results. An ergonomic electronic pipette delivers quick and precise results without straining the hand, like a manual pipette does. On one side we have the Sartorius Biohit Picus and on the other is Rainin E4 XLS. The Biohit Picus straight body design adequately balances the weight from the motor and channels which makes it very light. When held, the hand fits nicely onto the handle and access to the aspiration button is at a comfortable distanced for the thumb. The Rainin E4 XLS is awkwardly balanced as the weight of the motor and channels have not been properly distributed. When held, the user can immediately feel the heaviness of the motor. Though, the aspiration and ejecting buttons are also at a proper distance. 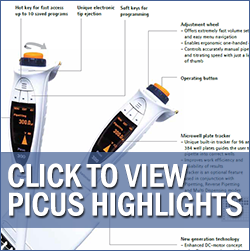 Overall, the Sartorius Biohit Picus and E4 XLS electronic pipettes are ergonomically different. 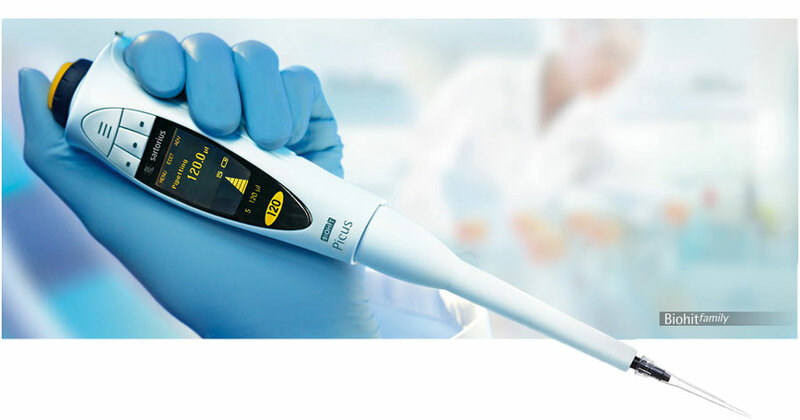 If you are looking for a light ergonomic electronic pipette then the Sartorius Biohit Picus is your best choice. It is the smallest and lightest electronic pipette on the market. It is much smaller in size than the Rainin E4 XLS so that you don’t have to lift as high to remove tips out of the tray. While this seems insignificant, lab technicians doing it thousands of times a day will notice a significant impact. Its ergonomic design helps prevents repetitive strain injury (RSI). The Sartorius Biohit Picus has comfortably and non-strenuous located buttons. The force required to aspire and eject is less in comparison to manual pipettes. Instead of spending an extended period of time & effort aspirating, dispensing, and ejecting, the Sartorius Biohit Picus completely lessens the stress suffered by a lack of an ergonomically designed electronic pipette. The Rainin E4 XLS does provides quick and efficient results, but after working with it for a few hours, you will notice your hand becoming tired due to the unbalanced weight. If you are a lab technician who dedicates countless hours a day loading pipette tips & aspirating, and ejecting liquids, you need an ergonomic electronic pipette that will not strain your hand. The Sartorius Biohit Picus is the perfect solution for those looking for a light weight and precise electronic pipette! For a demo of the Sartorius Biohit Picus electronic pipette please contact us at 800-234-3232 or email us at info@pipette.com. https://solutions.pipette.com/wp-content/uploads/sartorius-biohit-picus-display.png 382 179 Scott https://solutions.pipette.com/wp-content/uploads/pipettecom-logo.png Scott2013-08-06 17:06:222015-02-19 13:25:45What is the Most Ergonomic Electronic Pipette?